The enhanced Check Point Antivirus Software Blade stops incoming malicious files. 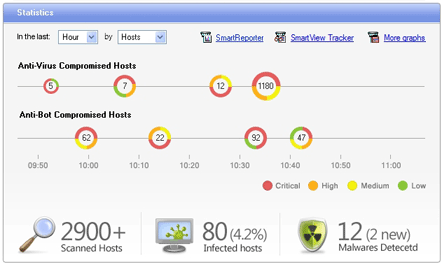 Using real-time virus signatures and anomaly-based protections from ThreatCloud™, the first collaborative network to fight cybercrime, the Antivirus Software Blade detects and blocks malware at the gateway before the user is affected. ThreatCloud is a collaborative network and cloud-driven knowledge base that delivers real-time dynamic security intelligence to security gateways. That intelligence is used to identify emerging outbreaks and threat trends. ThreatCloud powers the Antivirus Software Blade allowing gateways to investigate always-changing malware signatures. Since processing is done in the cloud, millions of signatures and malware protection can be scanned in real time. ThreatCloud's knowledgebase is dynamically updated using attack information from worldwide gateways, feeds from a network of global threat sensors, Check Point research labs and the industry's best malware feeds. Correlated security threat information is then shared among all gateways collectively. Check Point Antivirus Software Blade stops incoming malware attacks with 300x more signatures than previous versions. Multiple malware detection engines are utilized to protect your network, including signature and behavioral engines. Malware is identified as it attempts to get into or out of your network and leverages ThreatCloud for up-to-the-minute updated detection of malware. The Antivirus Software Blade scans outbound URL requests and ensures users do not visit websites that are known to distribute malware. The knowledgebase is updated in real-time with over 300,000 sites from the ThreatCloud and is constantly updated.